You'll be £14.99 closer to your next £10.00 credit when you purchase Welsh Yeomanry at War. What's this? Order within the next 6 hours, 55 minutes to get your order processed the next working day! Soon after the outbreak of the Great War, following many years of part-time soldiering as cavalry troops on home defence duties, the members of various British Yeomanry regiments were asked to volunteer for overseas service. In 1916, officered by well-known members of the landed gentry, two of the Welsh Yeomanry regiments, the Pembroke Yeomanry and the Glamorgan Yeomanry, were amongst many who embarked for foreign service for the first time ever in their history. Spending the next twelve months in Egypt during the campaign against the Senussi tribesmen, the two regiments merged to form the 24th (Pembroke and Glamorgan Yeomanry) Battalion, Welsh Regiment, which joined the 74th (Yeomanry) Division to take part in the historic offensive into Palestine, that ultimately led to the liberation of the Holy City of Jerusalem after 400 years of Ottoman rule. In May 1918, after two years of hard campaigning in the Palestinian deserts, the 24th Welsh embarked for France with the rest of the 74th Division, joining the Allied forces in the victorious 100-day offensive against the Germans. Welsh Yeomanry at War sheds new light on the battalions almost forgotten campaign in Palestine, which saw many of its troops killed and buried in the Holy Land, and also tells the enthralling story of its short but arduous period in France. As well as providing wonderful photographs, such as men head above head peaking out of a tent, and the Pembroke Yeomanry Drill hall, the narrative gives the reader a good understanding of the wider mobilisation of Territorial units at this time. Not all books are so comprehensive in these areas, and this is reflective of the author's dedication and continued research in this field. It is quite inspirational. A well-rounded concise history with a lengthy and informative appendix section. It's a great addition to Pen & Sword's 100 Years series of Great War books. 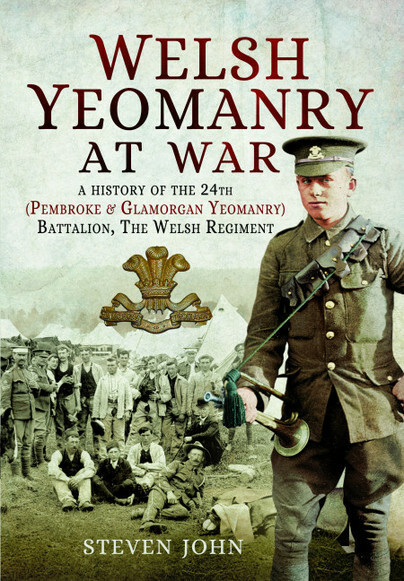 A masterpiece of exhaustive research, "Welsh Yeomanry at War: A History of the 24th (Pembroke and Glamorgan) Battalion The Welsh Regiment" is an impressively informative and exceptionally well written study. Featuring illustrations, three Appendices, a one page Select Bibliography, and a thirteen page Index, "Welsh Yeomanry at War" is an extraordinary and unreservedly recommended addition to both community and academic library 20th Century Military History collections.